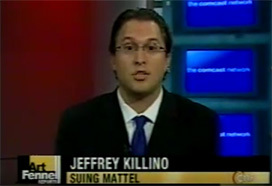 At The Killino Firm, our cases are the news. 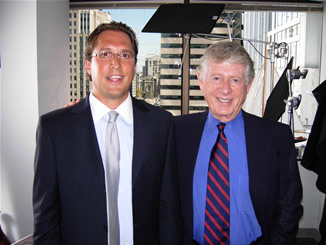 Legendary TV anchor Ted Koppel recently visited our offices to interview Attorney Jeffrey Killino about how our law firm’s relentless style of investigation caused the American distributor of tires manufactured in China by the Hangzhou Zhongce Rubber Company to recall over 450,000 light truck tires. To view the Ted Koppel interview, click here [when available]. From CNN to ABC to Fox and around the world, our cases have been featured on major news programs – locally and throughout the country. The national tire recall is just one example of how The Killino Firm cases are the news. When we filed a class action lawsuit against Mattel to force the toy manufacturer to pay for testing of children at risk of lead poisoning from its toys, we were interviewed and featured on many major news networks – because our case was the news. We make the news because we are dedicated to assuring that our clients, and every American, can feel safe and secure when buying tires, playing with toys, and using the many items we take for granted in our daily lives. Feel free to view one or more of the many video news clips that demonstrate how The Killino Firm is Keeping America Safe. When you need a lawyer who will exhaustively investigate your case and make sure that every responsible party is held accountable, contact The Killino Firm, where Keeping America Safe is our primary goal. To speak with one of our attorneys, call us toll free at 877-875-2927, or contact a personal injury lawyer via email. We will respond promptly to your inquiry so that you can experience the The Killino Firm Difference.